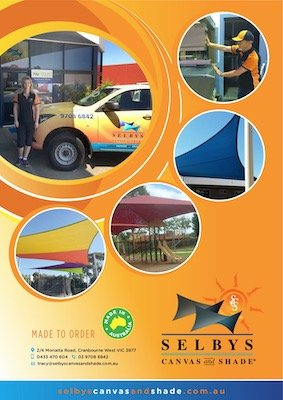 Selbys Canvas and Shade is a Canvas Fabrication Manufacturer that custom make to order Shade Sails, Trailer covers, Banners, Truck Tarps, Builders Tarps, Pallet covers, Post Pads, Sand-Pit covers, and many other PVC and Canvas items. We also do repairs on Shade Sails. Please refer to our services page and gallery on what we can custom make for you. Selbys Canvas and Shade do not out source any part of the manufacturing process. The owner of the business personally oversees all aspect of the manufacturing process from the design through to the final stich and packaging of your custom made product. This is how Selbys Canvas and Shade can give you a total and full guarantee on each and every product supplied. We know our product will always exceed the expectations of our client’s needs. In this day and age where everything is mass produced, in most cases from overseas manufacturers, it is refreshing to know there is a business with years of experience that takes pride in their work, making a high-quality product in Cranbourne West, Australia. Named after the sails of a yacht, shade sails are pieces of fabric or canvas that are extended over an area using anchor points to secure them. The design of the shade sail allows it to be structurally sound with our changing weather conditions, while being practical for use in many different applications. Whether you are wanting to create weather protection in your own backyard or utilize extra space in your work environment shade sails are a great and inexpensive solution.